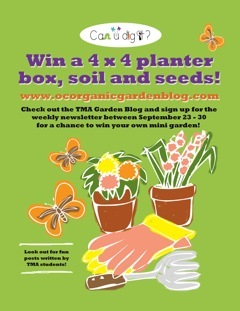 Subscribe to the OC Organic Garden Blog and be entered to win a 4×4 planter box, soil and seeds. All entries must be submitted by Sept. 30, 2011. So hurry and subscribe today using the subscribe box found on the lefthand side of the blog.